"Vendors pitch software to take over routine tasks"
We all applaud the government’s efforts to develop performance measures to evaluate programs and expenditures. The private sector runs its operations using many different performance measures — earnings per share, profit percentage, revenue growth and others that have been developed over the years. Each industry — manufacturing, financial services and transportation, for example — has unique measures. Federal contractors also measure their business performance by factors other than revenue or expenses. They look at margins, growth, profitability and cost per employee. In a high-value consulting business such as Booz Allen Hamilton or Accenture, revenue of more than $100,000 per employee is probably typical. By contrast, in the low-margin, high-volume business of commodity or administrative services, revenue is about $50,000 per employee. The public sector does not have widely accepted performance measures analogous to those in the private sector that they use to manage agency business operations. Government agencies rely on a somewhat novel performance metric: How big is my budget? Growth in information technology budgets is good. The Bush administration is seeking a 2.8 percent increase in IT spending in fiscal 2007. By contrast, a decrease is bad. The Homeland Security Department gets a 21.2 percent increase, so that is good. NASA gets a 5.6 percent decrease, so that is bad. Right? What do those numbers actually mean as good or bad performance measures? They don’t mean anything. Perhaps the federal government should use a simple performance measure of IT expenditures per employee. We would get some interesting results that could lead to perceptive questions and help us manage IT spending better. Who would have guessed that the Education Department spends more than three times more on IT per employee than DHS? IT spending per employee at the Energy Department is more than nine times the amount the Interior Department spends. Why does the Transportation Department spend more per employee than the Defense Department? Which agency gets more bang for the buck? Is it DOE, which spends $140,000 per employee, or Interior, which spends $14,000 — a tenfold difference? Although those figures do not reveal which agency is managing IT better, the data offers a starting point from which we can ask meaningful questions. But if we had standards with which we could compare, we could make better judgments and spend more efficiently and effectively. We do not know which agency is managing its IT best because we do not have accepted performance measures. We need to develop them. 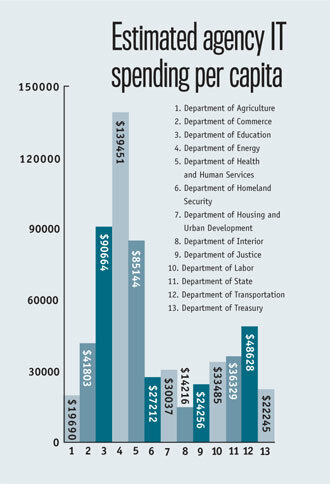 Someone should ask questions to try to understand and explain the reason for the differences in agencies’ IT spending. Molaski is president and chief executive officer of e-Associates, a consulting firm in Falls Church, Va. He was DOT’s chief information officer from 1999 to 2001.